He married Louisa Jane Brown2,3,6,11,12 [Luisa J. Brown13], Jul 24 18602,3,6,11,12, Woodford County, Illinois2,3,6,11,12. Louisa, daughter of William P. + Rebecca Brown2,3,10,13, was born Oct 8 18402,3,10,13 [about 184214], Ohio2,3,10,13. Louisa died May 20 1870, Carlock, Hudson Township, McLean County, Illinois; age 28.1,3,10,14 Medical: Louisa died from "Puerperal Fever"14 (presumably purpura due to, or coincident with, a fever). Hinshaw, Adolphus, age 29, born in Illinois; farmer; $3200 real estate; $1200 personal property. Hinshaw, Elmer, female [sic] age 7 [27 apparently scratched out to show 7], born in Illinois; keeping house. Hinshaw, Elzada, female age 5, born in Illinois. Hinshaw, Ellen, female age 3, born in Illinois. Callender, Jonathen, male age 20, born in Ohio; hand on farm. 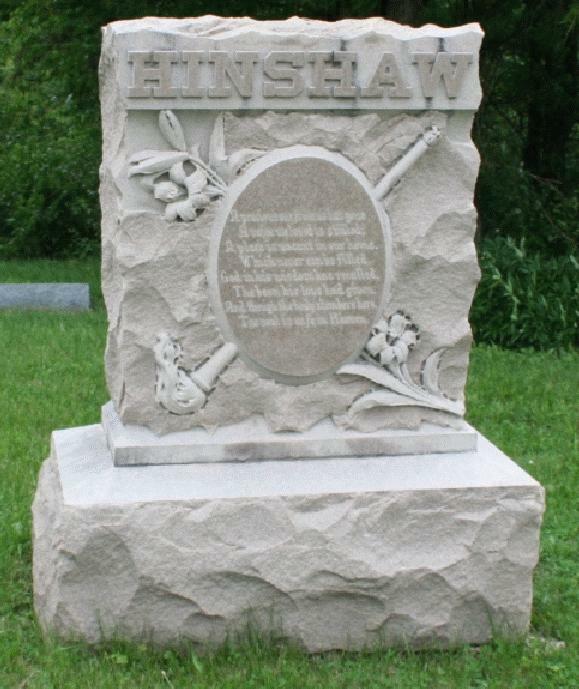 Hinshaw, A.D., age 39, born in Illinois; father born in Tennessee; mother born in Kentucky; farmer. Hinshaw, Ella E., wife, age 35, born in Ohio; parents born in Ohio; keeping house. Hinshaw, Elmer, son, age 16, born in Illinois; father born in Illinois; mother born in Ohio. Hinshaw, Elzada, daughter, age 14, born in Illinois; father born in Illinois; mother born in Ohio. Hinshaw, Frank W., son, age 6, born in Illinois; father born in Illinois; mother born in Ohio. Hinshaw, Nellie M., daughter, age 2, born in Illinois; father born in Illinois; mother born in Ohio. 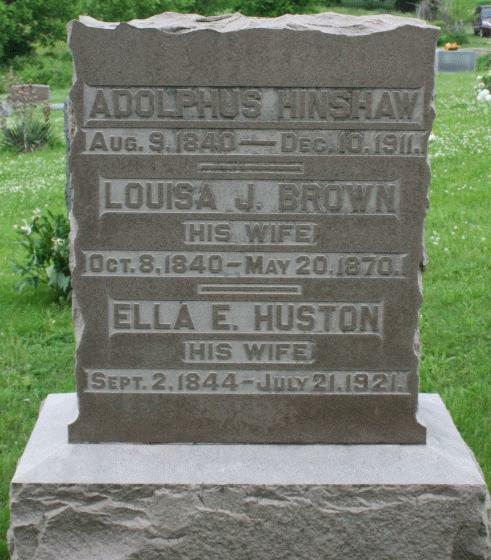 Hinshaw, Adolphus, head-of-household, age 59, born Aug 1840 in Illinois; father born in Tennessee; mother born in Illinois; married 28 years; occupation: retired farmer; owned home. Hinshaw, Ellen E., wife, age 55, born Sep 1844 in Ohio; parents born in Ohio; married 28 years; 3 children, 2 living. Hinshaw, Frank W., son, age 26, born Oct 1873 in Illinois; father born in Illinois; mother born in Ohio; single; occupation: farmer; rented farm. Hinshaw, Nellie M., daughter, age 20, born Oct 1879 in Illinois; father born in Illinois; mother born in Ohio; single. Hinshaw, Adolphus D., head-of-household, age 69, born in Illinois; father born in Tennessee; mother born in United States; second marriage, married 38 years; occupation: own income; owned home (free). Hinshaw, Ellen E., wife, age 65, born in Ohio; parents born in Ohio; first marriage, married 38 years; 3 children, 2 living. Hinshaw, Ellen E., head-of-household, age 75, born in Ohio; [parents' birthplaces unreadable]; widow; owned home; [occupation unreadable]. "The Hudson Colony", by Ruth Bitting Hamm, "A Project of the Hudson Bicentennial Commission, Hudson, Illinois 61748" (1972?). 1880 census, Hudson Township, McLean County, Illinois; roll T9-0230, ED 168, page 363A, line #1, dwelling #1, family #1. 1870 census, Hudson P.O., Hudson Township, McLean County, Illinois; roll M593-259, page 450, line #17, dwelling #35, family #35. The Church Of Jesus Christ of the Latter Day Saints (LDS) International Genealogical Index (IGI) - Illinois. 1900 census, Hudson Township, McLean County, Illinois; roll T623-322, ED 108, page 12A, line #41, dwelling #225, family #225. 1860 census, Stouts Grove P.O., Kansas Township, Woodford County, Illinois; roll M653-241, page 851, line #11, dwelling #1583, family #1581. 1910 census, 1st Ward, Eureka, Woodford County, Illinois; roll T624-337, ED 136, page 272B, line #71, dwelling #129, family #135. McLean County Historical Society; McLean County book D pg 102. 1850 census, Money Creek Township, McLean County, Illinois; roll M432-117, page 50, line #11, dwelling #938, family #958. 1870 Mortality Schedule, Hudson Township, McLean County, Illinois; roll T1133-59, page 963. 1870 census, Hudson P.O., Hudson Township, McLean County, Illinois; roll M593-259, page 450, line #22, dwelling #36, family #36. "McLean Co. Marriage Records 1831 - 1872", Book F, page 457. 1920 census, Eureka, Crugar Township, Woodford County, Illinois; roll T625-419, ED 165, page 5B, line #92, dwelling #134, family #137. 1900 census, Hudson Township, McLean County, Illinois; roll T623-322, ED 108, page 13A-B, line #47, dwelling #248, family #248. Family Group sheets gathered at the 1992 Hinshaw reunion, submitted by attendees. 1920 census, Eureka, Crugar Township, Woodford County, Illinois; roll T625-419, ED 165, page 5B, line #97, dwelling #136, family #139.